Choosing the right wedding ring is a very important part of the wedding preparations. 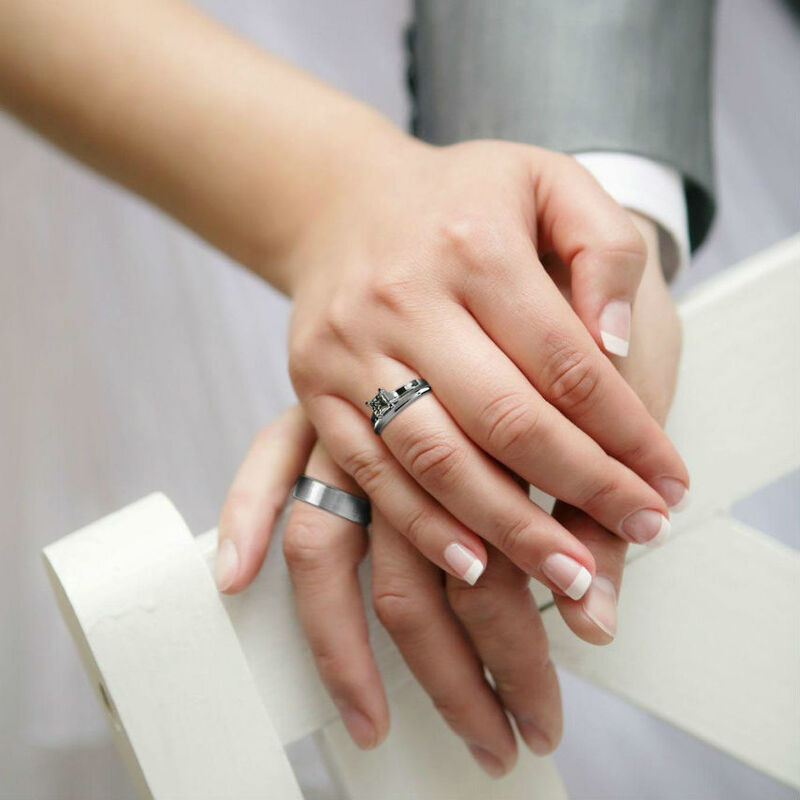 Wedding rings aren't just ornaments; they hold a much deeper meaning. Besides the 'beauty' aspect of the wedding ring, one has to consider comfort as well. Since a person wears the wedding ring on a daily basis, it is essential to make sure that the wedding ring you purchase is comfortable enough. One significant factor in choosing a wedding ring is the kind of metal. The days are gone when the choices were pretty much limited to yellow gold or diamond rings. With the passage of time, sterling silver jewelry and sterling silver wedding rings have become incredibly popular. They are very compatible with the momentous occasion of a wedding. Sterling silver wedding rings, just like any other silver jewelry, always have an adorable modern look; this makes it desirable and a perfect match for every outfit. Gone are the days when only diamond and platinum rings were considered too good enough for wedding rings and anything else was considered inferior. Although silver had been in use for a long time, mainly because of its aesthetic qualities, only recently has sterling silver been used much in wedding rings. And, not surprisingly, they soon captured the market. These days, many couples choose wedding rings made of sterling silver. The chief reasons for the growing popularity of the sterling silver wedding rings are their affordability and versatility. It is not too difficult to engrave and resize a sterling silver ring. This is because sterling silver is ductile and has a low melting point. This reflective metal is also easy to take care of. You can easily clean your ring using a soft cloth. Make sure you don't exert too much force while cleaning, otherwise you might leave scratches. So take your time and carefully clean your ring. Some individuals go for toothpaste when cleaning sterling silver jewelry; this is a bit bad because toothpaste might make your wedding ring look pretty dull. Also, to make sure that your precious sterling silver wedding ring doesn't tarnish, don't expose it to any corrosive agents such as detergents, chemicals, etc. If you are on a budget and looking for an elegant, stylish wedding ring for your beloved, then a sterling silver rings is a perfect choice. It is sturdy, long-lasting, non-allergenic, light and, in short, an ideal metal for a wedding ring. Sterling silver wedding ring though very sleek and contemporary, is also very affordable than a diamond or a platinum ring, but it looks just as exquisite and delicate. So keep sterling silver wedding rings in mind when you go hunting for the perfect ring for your life partner. Sterling silver wedding rings are undoubtedly an excellent choice. When you're just starting a life with someone new, finances can be tight. Sterling silver wedding rings offer an affordable way to wear a precious metal that symbolizes your love for one another and do so in a way that won't break your bank account. When considering the purchase of sterling silver wedding rings, set a budget before going shopping. This will help you to choose the perfect design at the perfect price. Whether you prefer solid sterling silver wedding rings, a design that features channel set gemstones or anything in between, the choice is yours. The style of your wedding ring is a very personal decision, and you can basically use any ring as a wedding ring. A hallmark is a mark stamped on articles of gold, silver or platinum in order to certify their purity. All sterling silver wedding rings, along with any piece of sterling silver jewelry, will be hallmarked as .925. Always be sure to look for the stamp, which is most commonly located on the inside of the ring. Consider the width. If you purchase a wide ring or one that has a significant thickness in the ring, you may need to go up ½ sizes to one full size, depending on the width and weight of the ring. If your sterling silver wedding rings are thin, you should stay true to your original ring size. If you purchase a ring and it doesn't quite fit, you can always have sterling silver wedding rings re-sized by a professional jeweler. The cost is relatively inexpensive, and should not compromise the look of the ring in any way. The only exception is if there are gemstones around the entire ring, such as the case with an eternity ring. These types of rings cannot be sized. Did you know that you can have sterling silver wedding rings engraved? Well, you can. Even if the outside of the ring has gemstones set along the ring, you can still engrave the inside of the ring. Popular choices include a name, wedding date or special message to your spouse. When you exchange sterling silver wedding rings on the day of your wedding, the inscription will be a wonderful surprise to your spouse. In order to prevent tarnishing, keep your sterling silver wedding rings in their original box. You can also add an anti-tarnish strip or purchase a jewelry box with a special lining designed to keep your sterling silver looking great for years to come. Even gold can tarnish, so if you happen to notice a little discoloration in your sterling silver or you simply want to give it a quick polish, don't fret. Instead, purchase a polishing cloth and give it a quick swipe for an instant shine. • Silver pendants; made from gemstone encrusted, pendant locket, pendant charm, crystal pendant, lapis pendant, turquoise pendant, quartz pendant, plain silver pendant etc. •	Partially valuable studded stones; with an embedment of Lapis lazuli, amber, coral, turquoise, amethyst and black onyx.